Last year my husband and I moved to our little farm in Virginia. We bought a small abandoned farm where we are beginning a new chapter in our life. A new simple life. 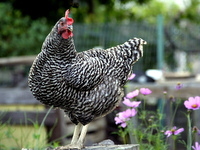 For several years we had been raising our own food by gardening and raising chickens for meat and eggs. Now here at the farm we have the space for the addition of Nubian goats for milk and a Great Pyranees named Sophie to our homestead. Currently we are living in our 32′ motorhome while the century old farmhouse is being restored. It’s small, bu t comfortable. This will be a busy year as we establish our first garden and build new homes for the livestock as well as begin work on restoring the old farmhouse. This quiet life-style is quite different from the hectic pace we lived for so many years. No more sounds of sirens, squealing tires, and loud neighbors. Here, where there are no city lights, we can see the night sky in all it’s glory, and watch as hundreds of fireflies light up the fields. The only sounds we hear are the insects, and once in a while a distant “mooo” from a neighboring farm. This is where we intend to live, quietly, peacefully and simply as our grand-parents did a century ago. We have just bought 154 acres in rural Queensland, Australia and over the next 3 years plan to establish vegie gardens, chicken coops, animal shelters etc and then finally in 2019 building a house and retiring to the peace and quiet. I will follow your blog with great interest as we start our journey together at opposite ends of the world! Shona that is awesome! I would give anything to be your neighbor out there. It sounds wonderful and I wish you every happiness in your new adventure. Hi there Kathleen, Congrats and wishing you a smooth journey:) I was looking for the “followers” button (like on the Henny Penny blog) as I prefer it to go there rather than email – just curious. I will still follow & check back. Glad you are up and at em again! The Nubians are adorable! Hi Girl! I am happy to see you here! It looks beautiful, Kathleen. It sounds so peaceful, too. Love your writing. Thank you Stephenie. I am glad you enjoy the site. Hi, Kathleen. Again apology for my post. Wow, I can’t imagine your frustration. Love your new home and can’t wait to see the progress and finished product. Your blog brings back a lot of memories…I will be going back to Ohio this weekend after 30+ years to see my sister, Kathleen, and her family. I am 75 and she is 81.